Here’s a very cheap outdoor weatherproof case for the Raspberry Pi. I’ve been experimenting with the AirPi weather sensor kit (available on Tindie). This is a lovely kit which comes bundled with an air-pressure, humidity, light, temperature, NO2 and CO sensors. The AirPi is fairly easy to solder together and comes complete with some nice software that automatically uploads your recordings to Xively. As it’s written in Python it’s also quite easy to see what’s going on – and the whole project is available on GitHub. I did find that the software needed a bit of work (don’t expect it to be perfect out of the box), but it’s a good starting point – part of the Raspberry Pi adventure is about trying to come up with your own ideas and improving on the work done by others. It’s also particularly impressive that the AirPi was put together by an 18 year old in his spare time. If the AirPi kit is a bit steep you can also hook up a DHT22 temperature and humidity sensor – there are tutorials available on how to setup logging on your Pi, and for about £10 you can put together a simple weather station that can take readings over time. Since it’s more fun to take readings outside, I’ve been looking at weatherproof case options for the Raspberry Pi. The white louvred boxes you sometimes see on street corners, outside science labs or in the middle of school fields are called Stephenson screens. These allow for the weather sensors to have air circulate around them and are carefully designed to minimise the effects of sampling error – by providing a standard way of mounting and housing scientific instruments. As Stephenson screens are no doubt quite expensive (and my AirPi hasn’t been calibrated anyway) I’ve opted for a cheaper option, which also manages to include a few of the features of it’s more expensive counterpart. The key things I’m aiming for are: standard (and repeatable), allows air to circulate around the sensors, and white and reflective. 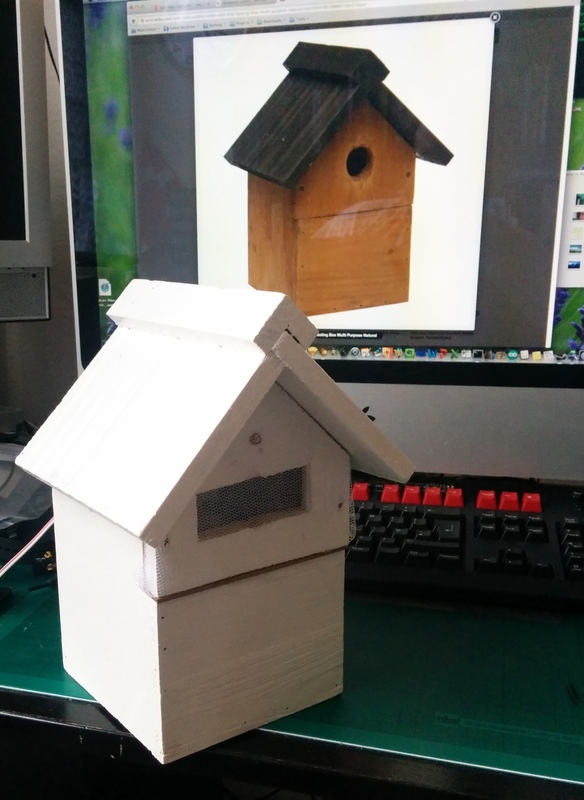 For a fiver from Wilkinsons (in the UK) you can buy a bird box which makes a cheap and effective weatherproof housing. You’ll also need a dremel (or similar small drill), some sandpaper, waterproof outdoor gloss paint, wood glue and insect netting. This is a box made from softwood, so it’s very easy to work with – you can use a dremel or a junior hacksaw to make holes. The plate with the birdbox hole is removable, and the pi sits on top of a piece of cardboard which wedges inside. The spare bits of wood from the hole were used to make rests for the Pi mounting board. I modified my AirPi kit slightly – first I adjusted the height of the header pins so that the board would fit on top of a modmypi plastic case – second I didn’t solder the light sensor directly to the board. Instead I soldered a couple of header pins to the board, and then a couple of leads to the sensor – allowing it to be fitted in a different place. In the image below you can see the light sensor mounted in a hole in the front plate – it sits behind a clear lego stud which serves as a little window. The Raspberry Pi sits inside the box on a piece of board – I cut up the back of an old picture frame. Depending on how you’re planning to communicate with your Pi (in this case a model A with a Wifi dongle) you might need to make a hole in the back of the birdbox for the USB to stick out. In my case the WiFi module fits snugly in the hole in the back of the bird box, which was then covered with a bit of board and painted. For power I used a low profile USB – micro cable which is hooked up to a USB terminal block inside the case (scavenged from an old digibox). The Pi is orientated inside the case so that the green and red LEDs are visible through the wide hole in the font. You don’t need to add all these bits, just bare in mind that the Airpi uses a lot of power and long USB cables might have a negative effect on your Pi’s power supply. You might need to experiment with the materials – but the softwood is very easy to work with. You can buy wood filler if you make any mistakes. Once you’re happy with the fit of the Pi inside the box, paint the whole thing with white glossy outdoor paint. To stop insects or anything else nesting in the box, wrap the front plate in insect netting. Finally – test! – i’d recommend leaving the box in the rain (without your Pi) with some tissue paper inside just to check if there are any issues with water getting in. Obviously this can’t be 100% waterproof, but it’s good enough to leave your Pi on a windowsill or sheltered garden. How are you powering the unit if it’s outside? At the moment just with a long usb cable as it’s sat on a window ledge but I’m looking at using a Solar panel / USB battery.